It is a typical Portuguese communal flag, with the coat of arms centred on a plain black field. Shield, Or per fess a chestnut tree eradicated Vert with its burs Argent and a stag Sable, on a mound of three coupeaux Vert issuant from base three lozenges Argent set 1:2. 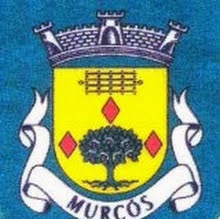 Mural crown Argent with three visible towers (village rank) and white scroll reading in black upper case letters "UNIÂO DAS FREGUESIAS DE ESPADANEDO, EDROSO, MURÇÓS E SOUTELO MOURISCO". These arms seems to be a combination of (some of) the preexisting component communes’ arms : lozenges and tree from Murçós, the triple mound from Espadanedo, and the stag, I presume, from an hitherto unknown coat of arms project either from Edroso or Soutelo Mourisco (none of which was ever granted official symbols). The stag’s posture and additional tinctures are not blazoned, so trippant at gaze and attired and unguled and langued and membered and "animated" (eyes) Gules, is assumed. It was one of the six communes of Macedo de Cavaleiros municipality, created by the 2013 changes, when to Espadanedo commune were joined the other three; commulatively the four erstwhile communes had 448 inhabitants in 2011 and cover 64.1 km². Within the communal territory are located eight settlements (most probably all villages (aldeias)): Espadanedo, Edroso, Murçós, Soutelo, Mourisco, Bousende, Cabanas, Valongo, and Vilar Douro. Shield Argent, a bendlet wavy Azure, in dexter chief a grindwheel Purpure pierced of the field, issuant from the base a mound of three coupeaux Sable. Mural crown Argent with three visible towers and white scroll reading in black upper case letters "ESPADANEDO - MACEDO DE CAVALEIROS"
Espadanedo Commune was one of the pre-2013 communes of Macedo de Cavaleiros Municipality; it had 188 inhabitants in 2011 and covered 17.9 km². Edroso Commune was one of the pre-2013 communes of Macedo de Cavaleiros Municipality; it had 95 inhabitants in 2011 and covered 12.3 km². Shield Or, a chestnut tree Vert eradicated Vert and fruited Argent, between three lozenges Gules set one and two, in chief a grill Sable. Mural crown Argent with three visible towers and white scroll reading in black upper case letters "MUR? ?S"
Soutelo Mourisco Commune was one of the pre-2013 communes of Macedo de Cavaleiros Municipality; it had 134 inhabitants in 2011 and covered 21.2 km².